London Bridge is already a huge foodie hotspot, from Borough Market to Maltby Street, and now there’s going to be a new kid on the block: Vinegar Yard. 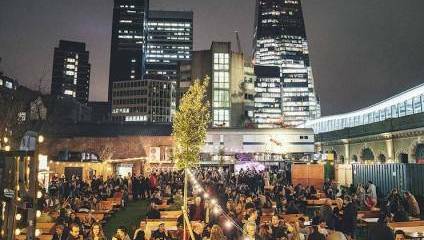 Setting up just a hop, skip and a jump away from the station, this new street food market will be an all-day destination hosting art installations and pop-up shops alongside food and drink traders. The most iconic of the art installations is sure to be the train carriage covered with giant ants whacked right at the entrance to the space, and there will be more from Joe Rush, a sculptor who has worked for Glastonbury – so his stuff is sure to wow. On the shopping side of things, Flea London will be taking over every weekend to make the yard a vintage-lover’s paradise, and there’ll be other vintage shops popping up in the week as well. But let’s get to the food. Already confirmed (though the line up will change regularly to keep things fresh) are Baba G’s, Million-Pound Menu winners and general rulers of the street food scene with their Anglo-Indian ‘naanwiches’. You’ll also see Italian vendors Sugo with their ciabattas and Nanny Bill’s with their comforting, homey mix of croquettes, burgers and more. And if that doesn’t sate you, why not just go all in and get a flame-grilled steak from Up In My Grill? One thing’s for sure: at Vinegar Yard, you’re not going to get bored.